What is Plastic Cloud Edition? 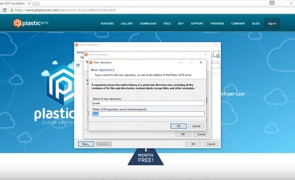 Plastic Cloud Edition is the sum of the Plastic SCM software plus a Plastic Cloud server and storage all packaged together in a single pay-as-you-go subscription. Teams can forget about managing infrastructure and licensing since this is all handled by Plastic Cloud. 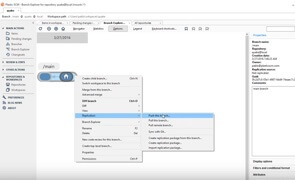 Client software and local repositories are installed on the developer’s computer, and then they push/pull to the cloud organization (or directly checkin to the cloud using Gluon). 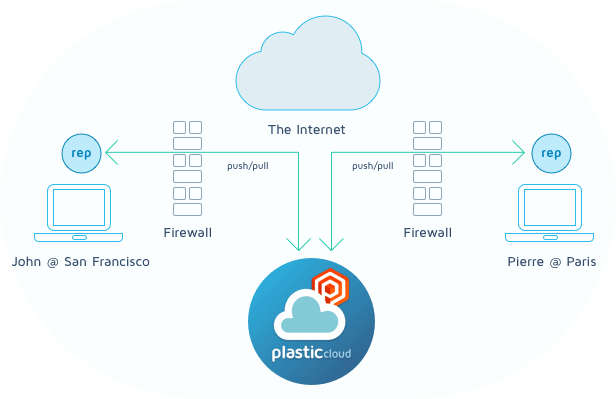 Plastic Cloud Edition is designed with fully distributed teams in mind. Teams that don’t want to consider running their own servers, and prefer hosting everything online. 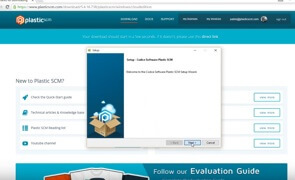 Plastic Cloud Edition provides a hosted version control solution plus all the required client software. Since Plastic SCM is a distributed version control (DVCS), a partial (or full) clone will be also stored locally on each developer’s machine. Teams pay per-use and there’s no need to add or remove licenses since Plastic Cloud tracks storage and number of active users. 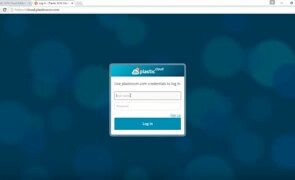 What can you do with Plastic Cloud Edition? 2 GB is not the limit here. Plastic supports big files and huge repo sizes by design. Plastic Cloud Edition starts with 5GB and grows as you need. Plastic Cloud is designed for teams who need private repos in the cloud on a safe way. You can setup your Plastic Cloud organization to use encrypted data. Data will always be encrypted in the cloud and only decrypted on your computers. 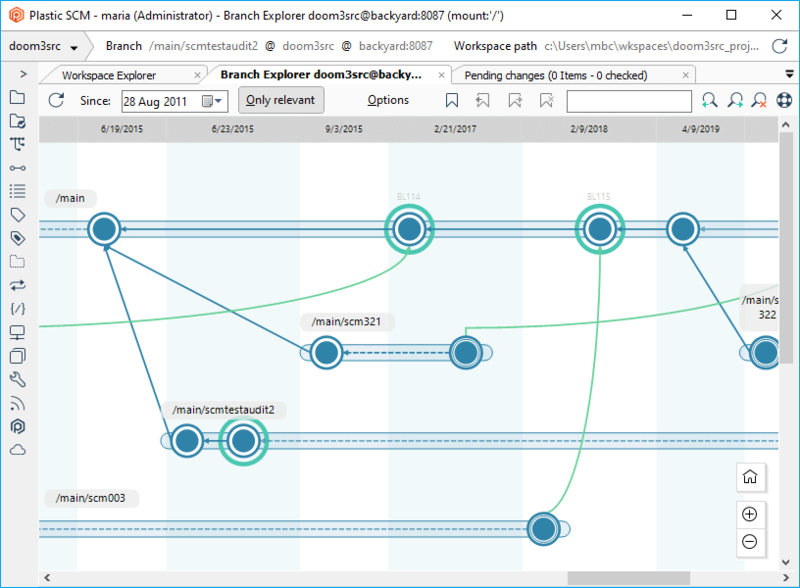 Developers will take advantage of the push/pull workflow while team members using Plastic Gluon can go for a simpler direct checkin cycle. The familiar push/pull way of working. The option of choice if you work with code. Just checkin your changes. No intermediate repos. No push and pull. The best option for artists in games (together with Plastic Gluon). Also available for coders who want to work centralized. You can select where your data is stored. The closest to you, the fastest the data transfer is going to be. 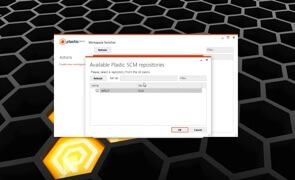 Plastic SCM includes the best version control tools and GUIs you can think of. Visit our gallery for more screenshots. Direct checkin to Plastic Cloud with Plastic Gluon. Direct checkin will be the workflow typically used by artists in game development and team members who don’t work in code but documents, plans and so on. They just modify and checkin. They never merge. 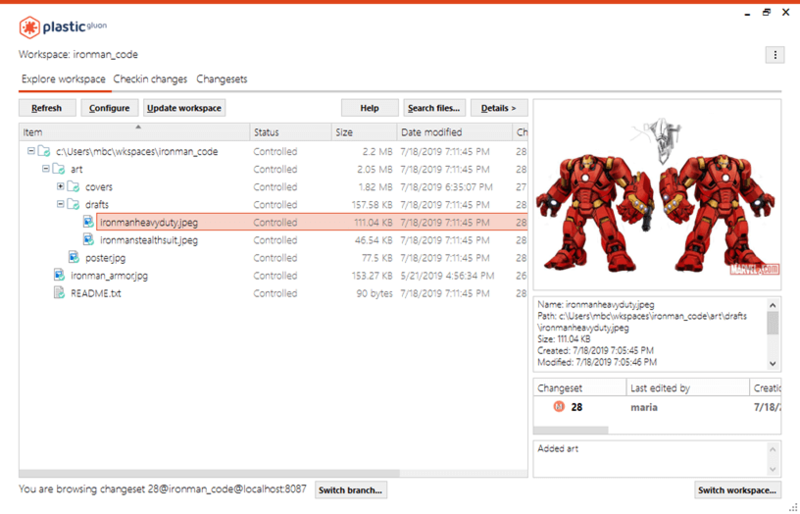 They lock files to avoid concurrent changes (on files that are unmergeable). They work on a single branch. They can now simply continue using Plastic Gluon and checkin directly to Plastic Cloud. A valid Plastic SCM Cloud Edition subscription. Each developer works on his machine, from his home office. They both belong to the same Plastic Cloud organization and deliver changes to Plastic Cloud through push/pull. Each of them has his own local Plastic SCM repo (or collection of repositories) so that checkins are always local and blazing fast. They checkin locally and then push when they’re done. They pull each other’s branches from Plastic Cloud and then one of them merges locally. Then he pushes the merged branches back to Plastic Cloud. 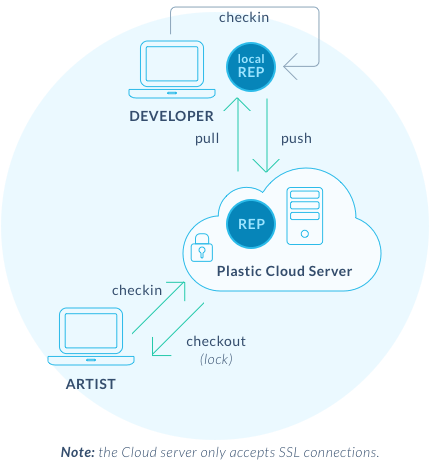 Developers using direct checkin to Plastic Cloud with regular Plastic SCM. 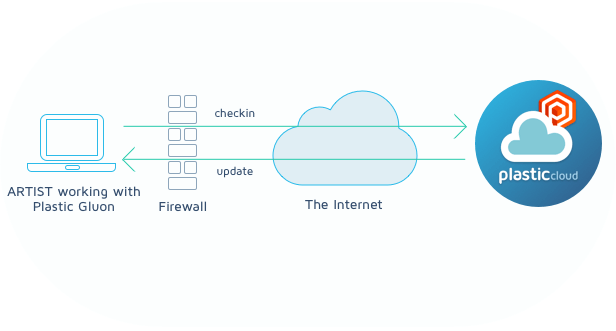 Direct checkin will be the workflow typically used by developers working on code. They just modify, checkin and merge their changes. They work on several branches. 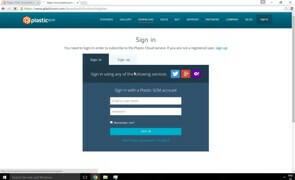 They can now simply continue using Plastic SCM and checkin directly to Plastic Cloud. Cloud Edition is designed for fully distributed teams to remove all maintenance and operation costs. The Cloud server and storage is handled by us so that you don’t have to worry about backups, upgrades or licensing. You first create a Cloud organization, then you invite your team members to join. Billing will depend on the number of active users in the organization every month. RobotCo organization is created in February and Mike, the owner, invites Sarah, Miles and Peter. Mike, Sarah and Peter frantically work during February, but Miles doesn’t use Plastic yet. In March, Miles starts using Plastic too. In April, Mike and Peter spend the entire month away at events. The team still didn’t reach the 5GB limit. No extra cost for the storage will be billed since the initial 5GB limit wasn’t exceeded. Once the initial 5GB of Cloud storage is exceeded, general Plastic Cloud fees will be applied. Check the pricing page for more information. How is it different than Team Edition? While both Team Edition and Cloud Edition are based on the same Plastic SCM core and tools, they’re designed with different kinds of teams in mind. Team Edition is best suited for teams who require an on-premise server installed at the office. Cloud Edition doesn’t include an on-premise server. In order to share code, developers push their changes to the cloud. Many Cloud Edition users won’t even have an office at all. Team Edition users can optionally subscribe to Plastic Cloud, but many of them won’t require cloud storage at all. Cloud Edition includes a Plastic Cloud organization by default, and teams will use it from the start. Team Edition is billed monthly or annually. Teams need to proactively add or remove user licenses and then install the new license on their servers. The total cloud storage space (first 5GB included at no extra cost). The number of active users accessing the Cloud during the billing period.